WorldGuy's Walk for Diabetes Awareness -: Overnight stop. I had a board meeting over the phone and we concluded it best to go south below the frost line. 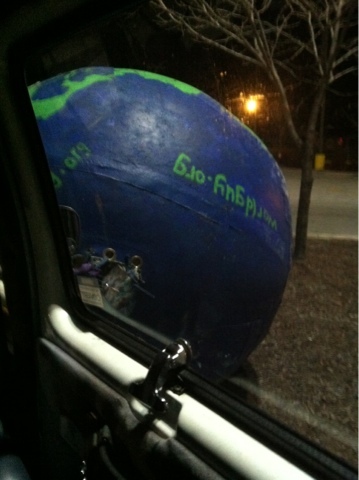 I drove to Bowling Green, found the WallyWorld and inflated the world. After gluing some of the patches that have loosened and darkness fell I tuned into the weather radio. It seems I have not gone far enough. The low temps will be in the twenties with rain and snow expected over the next days. The world is already frosting over from the moisture the sun didn't burn off. A few people stopped to ask what was up with the world so at least I got to get the message out while I was working the world over.